Recent events have further reminded anyone who has carelessly forgotten that Antonio Felix Da Costa is a seriously quick young racing driver, and is living proof Formula One is not always right. The paddock deemed him not worthy of a seat at the top table of motorsport, he’s now proving them fatally wrong. In the two years of 2012 and 2013 he set the junior single seater categories alight, with a very close third in the GP3 series being topped by an incredible partial campaign in the Renault World Series. On a grid that arguably bettered that years GP2 series, Da Costa finished an incredible fourth in the series, after missing the opening three rounds. Replacing fellow Red Bull driver Lewis Williamson, he won four of the twelve races he competed in, he finished only 23 points behind eventual champion Robin Frijns. With a full campaign he surely would have won the championship at a canter. Completing a year unlike almost any other junior categories racing driver, Da Costa then went and won the highly prestigious Macau Grand Prix, a race graced with a winners list that reads like a who’s who of the F1 grid. Antonio Felix Da Costa in action for the dominant Red Bull team at the end of year young driver test in Abu Dhabi, sadly this would prove a fleeting outing just as the Portuguese driver was on the cusp of a full time F1 seat. 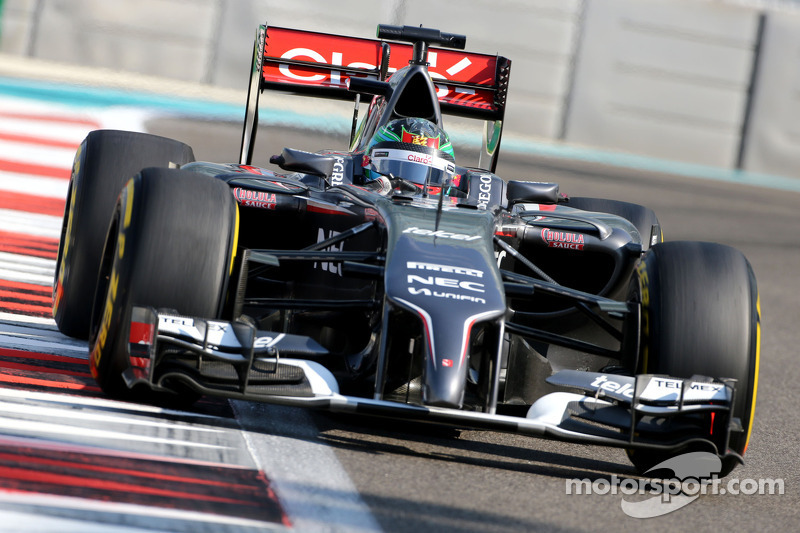 Photo copyright Red Bull Racing/Getty Images. Alas, after being tipped by Red Bull for promotion to their junior Scuderia Toro Rosso F1 team for 2014, the wheels fell off in 2013. Much was expected of Da Costa but he underwhelmed as he was over matched by Kevin Magnussen and rookie Stoffel Vandoorne. Third in the standings and three wins were not enough to save him, with GP3 champion Kvyat being promoted in place of him, an offer to join BMW in the DTM his best option for 2014. From this point onwards F1 began to leave him behind, focused on hyping the next wave of young drivers rising the ranks. Da Costa has made the transition to becoming a fully paid professional racing driver, but for some they would have foresaw him F1 this year, not the DTM. The highly competitive German Touring Car Championship is a very tough series to master, therefore it should not be shocking Da Costa has struggled to adapt to the series and his BMW M4. He shows flashes of potential but has yet to string it together for an entire year, with one win in three years of the series and a best final finishing place of 11th in 2015. Da Costa accepted a factory BMW drive in the highly competitive German DTM touring car series, something he struggled to adjust too so far. Flashes of potential show he’s still the same driver who should have found a place in F1. Here he is in action in 2014. Photo copyright BMW AG. Rising through the ranks it was clear Da Costa was a special driver. A karting series world championship runner up in 2006 first brought him to the attention of the motorsport world, before a move into cars for the 2008 season. Stepping right into the competitive Formula Renault categories, he focused on the Northern European Cup whilst team mate Valtteri Bottas fought it out for the Eurocup. Best of the rest behind the more experienced Bottas was no disgrace for Da Costa in his first year, with flashes of good form carrying over into the partial Eurocup campaign for him. 2009 would be the year to go for it and emulate Bottas by claiming both the Eurocup and NEC Formula Renault titles, the two most prestigious of the formula itself. A close third in the Eurocup was deemed slightly disappointing but not a career breaker, with a disqualification from the Nurburgring round for a technical issue in qualifying reining in a campaign just as he was closing in on the title. A dominant win in the NEC series was a good consolation prize and cemented his reputation as an up and coming young talent. Before F1 testing and the DTM was Formula Renault, where it all started for Da Costa. Victory in the NEC series and third in the Eurocup cemented his reputation as a rising star of the future. Photo copyright Renault Sport. F3 was the next rung in the ladder, Da Costa acquitting himself well with the Motopark team. Three reverse grid wins and a solid rest of year put him seventh in the final standings, also claiming the prize for being the highest placed rookie in the series. A switch to the British Carlin team for the unofficial F3 World Cup in Macau also proved fruitful, a sixth place finish a great sign of things to come in the former Portuguese colony. 2011 proved tough as he adjusted to a switch into the GP3 category, with only one win and 13th in the final standings to show for it. A partial campaign in British F3 prepared him well for Macau, but sadly a retirement put paid to any chance of resurrecting his career on the world’s fastest street track. Victory on his return to the Macau Grand Prix proved a welcome fillip for him after a difficult year in the DTM, but he was quick to pour cold water on the idea this would re-ignite any F1 ambitions. He seems very comfortable and happy with his roles at BMW and in the emerging Formula E championship. Whilst at one stage he seemed destined for Formula One, Antonio Felix Da Costa is by no means a failure because he didn’t reach his goals. He can be very proud of his achievements in his career, and whilst some in the F1 paddock may have forgotten about him, victories such as his latest at Macau are reminders to the motorsport world of his talent, and that he is entirely worthy of a place in Formula One. Any thoughts on this article? Feel free to comment below and share your views, find me on Twitter @brfcjordan95 and a huge final thank you for reading! The Lotus F1 team is known to have suffered financial problems in the recent past, although the team claimed to be on a much better financial footing going into this 2015 season. Their actions tell a different story however as the team have caused widespread confusion amongst the motorsport community by signing Carmen Jorda and Adderly Fong as development drivers recently. The F1 community reacted with ridicule to the announcement from the Lotus F1 team several weeks ago that they had signed the Spanish racer Carmen Jorda. On the surface this move seems to make sense, with Jorda racing for the last several years in GP3 and looking to progress up the single seater ladder. Dig deeper however and this move seems extremely bizarre if we believe the team that Jorda was hired based on her previous results.Jorda’s best results in her career so far was a 6th place finish in the 2009 European F3 Open series. Whilst this is a noteworthy result, considering it was her third year of F3 and the relative lack of serious high level junior competition in the European F3 Open series, this is slightly worrying. This result merited her moving up to higher categories however, as she stepped up to the Firestone Indy Lights series in America and then GP3 in Europe. 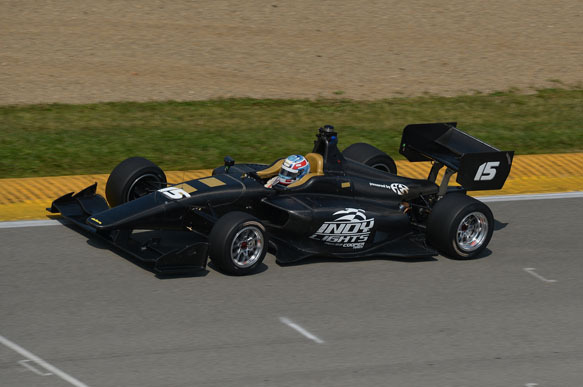 Jorda really struggled in Indy Lights and GP3, with her best finishing position in GP3 coming in her first year in 2012, where she finished 28th in the final standings. What’s slightly embarrassing for her is that late in her third year in GP3 last year, a car she spent all year at the back of the pack racing was taken by young Brit Dean Stoneman took to two wins and another podium in the final four races. This shows that it was most definitely not the car that caused her struggles in GP3, and shows the likely difference between a genunine young hotshot hoping for F1 in Dean Stoneman and another average GP3 driver such as Carmen Jorda’s results suggest she was. Despite these three disappointing years in GP3, in late February this year the Lotus F1 team announced they had signed Jorda as a development driver for the team this year. In the team’s statement they stated Jorda would work closely in the simulator for the team, with both sides stating this move is a big step in Jorda’s dream to drive a Formula One car. Whilst it’s unlikely the team will give her any Free Practice drives this year, she may well drive for the team some tests and appears to become an integral part of the team this year. Carmen Jorda racing in GP3 last year in another disappointing year for her. Photo credit goes to GP3/LAT. Just as this news died down the motorsport community reacted with another dose of scpeticism as Lotus announced Chinese-Canadian driver Adderly Fong as their latest development driver. 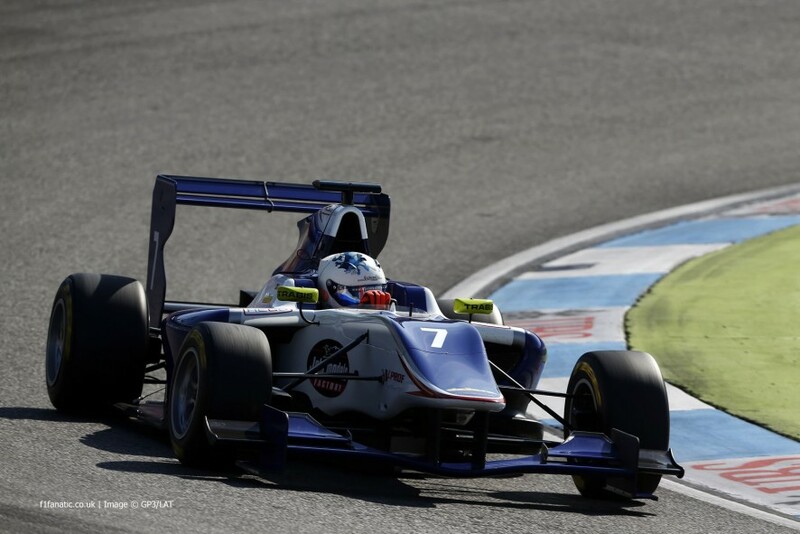 Fong has risen slowly through the ranks of the junior racing categories, although like Jorda struggled once he reached GP3. His best year was his first in 2013, where he finished 21st in the final standings with two points. He didn’t score again in his second year of the series, and has signed with Koiranen for his third year in the category this year. Fong has branched into sportscars over the past few years, before making his F1 debut late last year with a Free Practice run for the financially struggling Sauber team at the Abu Dhabi GP late last year. It appears Fong will have a similar role in the team to Jorda, with Fong also likely to bring funding to the team to support them throughout the year. The move also gives the team fresh press exposure in a rapidly expanding Chinese market, something the team will be looking to exploit. This move again seems strange when considering if the team hired Fong based on his results. It seems more plausible when considering that the team likely hired Fong to help his development, with Fong giving the team access to a huge new F1 market and some likely sponsorship money also. For Lotus they have left themselves open to ridicule amongst the F1 community by claiming the hiring of Carmen Jorda and Adderly Fong is based on their previous results in junior categories, when it seems much more likely the team hired these two young drivers because of the press exposure it gives them alongside the potential sponsorship money they can bring to the team. With reserve driver and GP2 champion Jolyon Palmer signed it seems unlikely both will see significant track time this year, making their signing a potential future problem for the team as both are looking for Lotus to help with their development of driver as both attempt to reach F1. The biggest plus for both drivers are the sponsorship money and press exposure they can bring to teams in F1, despite results in junior categories that suggest they should be nowhere near F1 based purely on apparent driving ability and previous results. This is systematic of a much wider problem of pay drivers and many F1 teams which are struggling financially. This situation means F1 could be diluted in terms of ultimate driving ability by paying drivers who have bought their place in F1 not purely earned it based it on results. This would be a huge shame for Formula One in my opinion, which is often lauded as the premier motorsport category in the world. Any thoughts on this article? Please feel free to comment any will be appreciated.